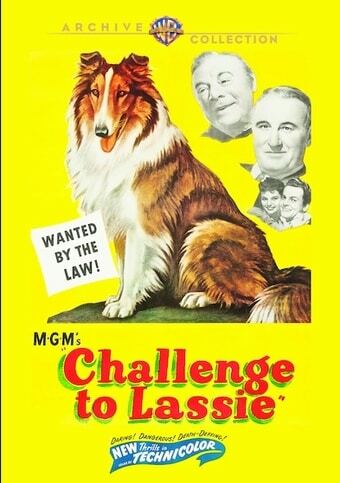 CHALLENGE TO LASSIE (1949), one of several Lassie films from MGM in the '40s, was released on DVD earlier this year by the Warner Archive. CHALLENGE TO LASSIE was written by William Ludwig, adapting the classic Eleanor Atkinson novel GREYFRIARS BOBBY. It was Ludwig's third Lassie film in a two-year period, following HILLS OF HOME (1948) and THE SUN COMES UP (1949), the latter of which was reviewed here in February. 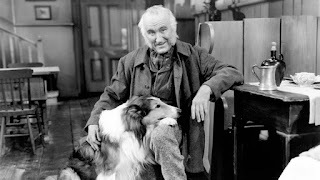 CHALLENGE TO LASSIE is the story of a Scottish shepherd, Jock Gray (Donald Crisp), who adopts Lassie when she's a wee stray pup. After Lassie grows up and is trained to herd sheep by Gray, they return to Edinburgh, where Jock is tragically murdered on the streets. The devoted Lassie is determined to sleep each night on his grave, to the consternation of those who say a dog isn't permitted in the churchyard. Lassie is threatened to be put down as a "stray." A court case ensues. 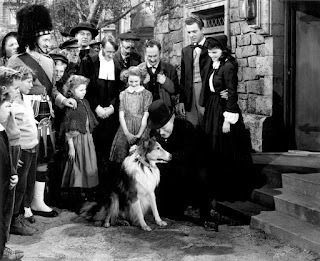 Lassie is helped by Gray's friend John (Edmund Gwenn), a tavern owner who tells her story to the court; his son William (Ross Ford), a law student; and Susan Brown (Geraldine Brooks), whose father manages the churchyard. This is a pleasant little film, with its bittersweet story made more watchable by its fairly short 75-minute length and the way characters come to Lassie's aid. It's also enjoyable for those who love good character actors, as the passing parade of faces in this one is rather remarkable. 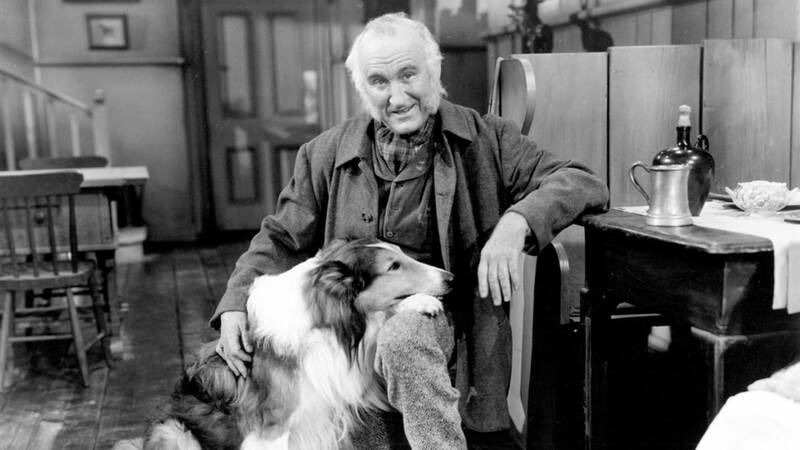 It's interesting to note that Donald Crisp appeared in four of MGM's five '40s Lassie movies; he played a character with the same name in SON OF LASSIE (1945), which I haven't seen. Donald Crisp and "dog movies" seem to go together. When Disney filmed the original GREYFRIARS BOBBY story in 1961, he also starred in that! GREYFRIARS BOBBY was Crisp's next-to-last film -- his final appearance being in SPENCER'S MOUNTAIN (1963), reviewed here just last night. Cast members Edmund Gwenn, Alan Napier, Reginald Owen, Arthur Shields, and Lumsden Hare had also appeared in one or more of MGM's previous Lassie films! 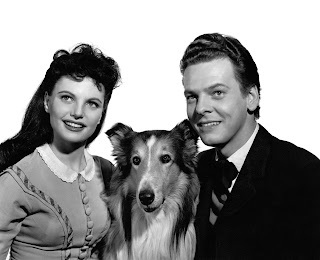 MGM made one more Lassie film after this, THE PAINTED HILLS (1951), with a completely unique cast headed by Paul Kelly, Ann Doran, and Gary Gray. 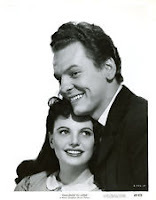 Young Geraldine Brooks is lovely and sweet as Susan. I've previously enjoyed her in films such as CRY WOLF (1947), THE RECKLESS MOMENT (1949), and especially EMBRACEABLE YOU (1948), which I hope will have a future Warner Archive release. I've been curious about CHALLENGE TO LASSIE since seeing the nice still at the right, which accompanied Brooks' entry in one of my favorite film books of the '70s, HOLLYWOOD PLAYERS: THE FORTIES by James Robert Parish. I acquired the book as a kid, and now I've finally seen the movie! More great faces in the CHALLENGE TO LASSIE cast: The wonderful character actor Henry Stephenson, in his last feature film; Kathryn Beaumont, Disney's ALICE IN WONDERLAND (1951); Jimmy Hawkins, one of the Bailey sons from IT'S A WONDERFUL LIFE (1946); and in a very small role, Sara Allgood, Crisp's wife from HOW GREEN WAS MY VALLEY (1941). CHALLENGE TO LASSIE was directed by Richard Thorpe. It was filmed in Technicolor by Charles Schoenbaum. The movie combines some nice-looking location shooting in the sheepherding and other sequences with a pretty but very make-believe matte painting standing in for Edinburgh. The film's attractive score was by 20-year-old Andre Previn, who started at MGM as a teenager! The Warner Archive DVD is a lovely color print. The trailer is included on the disc.